Malva L., Sp. Pl. 2: 687. 1753. 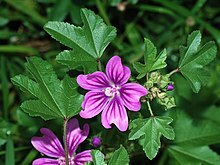 Type species: Malva sylvestris L.
Axolopha (DC.) Alef., Oesterr. Bot. Z. 12: 258. 1862. Dinacrusa G.Krebs, Feddes Repert. 105: 299. 1994. Farr, E. R. & Zijlstra, G. eds. (1996-) Index Nominum Genericorum (Plantarum). 2010 Febr 15 . Hinsley, S.R. 2009. Malvaceae Info. The Malva Alliance. 2010 Feb 19 . Linnaeus, C. 1753. Species Plantarum 2: 687. For more multimedia, look at Malva on Wikimedia Commons. This page was last edited on 2 February 2019, at 18:38.